His voice breaking, the man who came to the rescue of Arizona Department of Public Safety trooper Ed Andersson on Jan. 12 said the aftermath of that confrontation has been "overwhelming." He had little time to think and just acted instinctively, he said, firing his weapon to save one man's life while taking another, reports azcentral.com. 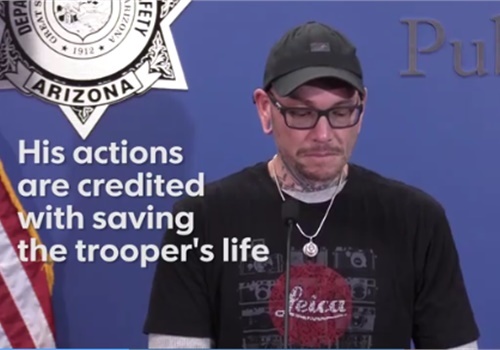 Thomas Yoxall, 43, spoke publicly for the first time Tuesday afternoon, describing what happened on a stretch of Interstate 10 in the far West Valley after he came upon the wounded trooper being attacked, his head being pounded into the pavement. Yoxall ordered the man to stop the assault; when the man didn't, he fired. Yoxall described his reaction as "visceral." "It’s who I am," he said. "I can't arbitrarily stand by and watch a tragedy like that unfold without doing what I can to intervene and stop it." In an emotional news conference at DPS headquarters, Yoxall said that while he still struggles with taking a life and has sought counsel from his pastor, he would do the same thing all over again.